The only boat in Bali with a 'jacuzzi' and a water slide from the top deck straight into the water. 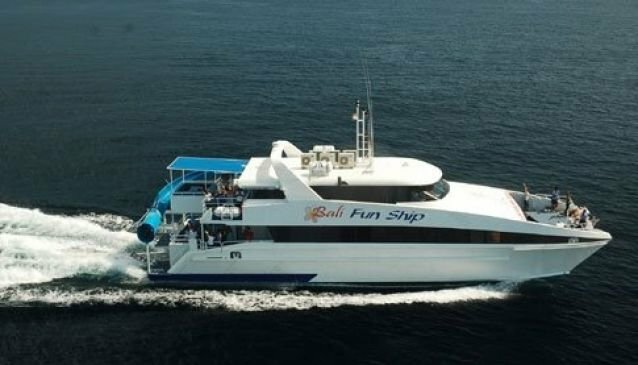 Departs daily from Benoa Harbour, Bali with a crossing time of approximately 40 minutes to Lembongan Island. Full Day Cruise US$ 92 /person. Departs Benoa: 09:00am. Departs Lembongan: 03.30pm. Take the whole family on an adventure on a truly 'Fun Ship'! Enjoy your morning refreshments as you cruise through Benoa Harbour, past Nusa Dua and Sanur on your voyage to Lembongan Island.